When Associated Charities’ board set the fundraising goal for a new building at $1.5 million less than a year ago, they weren’t exactly sure when they’d be able to meet it. Until they were challenged by Bob Archer to set a target date. “Bob called to meet with me and Rosemarie (Donley) and offered to donate $275,000, but we’d have to get the $1.5 million raised by June 1,” said Greg Gorrell, co-chair of the steering committee for the project. The day they met the goal? April 13, less than six months after the campaign started. Some donors even contributed twice. “Bob’s a businessman, I’m a businessman, so we know that you get nothing done unless you have a target,” Gorrell said. 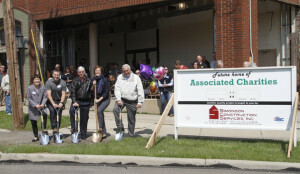 Associated Charities expressed gratitude for its 100 donors at a groundbreaking ceremony at 11 a.m. Wednesday. On one level of 8,400 square feet of space, the former Steiner building at 240 Cleveland Ave. will be redone and hopefully be ready by the end of August as windows, walls and the roof will be replaced and parking space will be added. 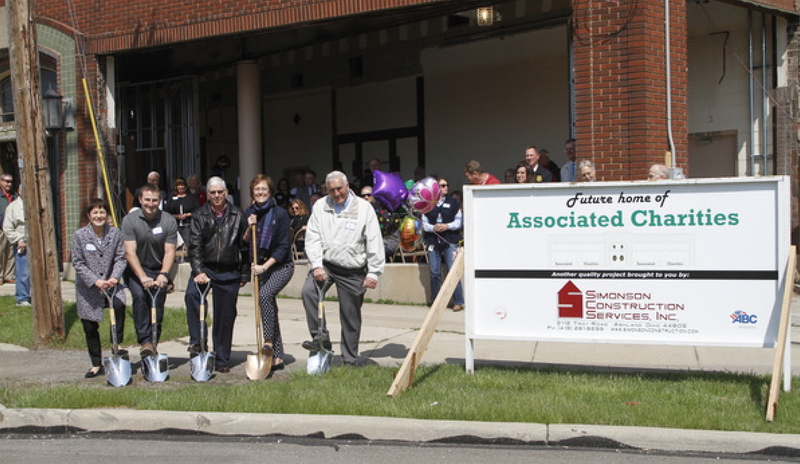 Lori Overmyer, Joe Reep, Greg Gorrell, Rosemarie Donley and Steve Englet participate in a ceremonial groundbreaking Wednesday for the new location of Associated Charities. Executive director Rosemarie Donley said she started thinking about finding a building larger than its 121 South St. location about five years ago to escape cramped space and provide Americans with Disabilities Act accessibility. The charity has operated from the location since 1988. The $1.5 million will fund two things: $1.2 million goes to building and $300,000 to an endowment fund to sustain it in the future. The charity purchased the building from the city of Ashland on Sept. 11 for $60,000. Office space will be in the front part of the building with warehouse space, a food pantry, a volunteer room and rooms for Christmas and school supplies for the J.U.S.S.T. back-to-school campaign toward the back. Additionally, multiple doorways in the front, side and back of the building will aid with traffic flow. Clients and volunteers could come through the front entrance but use the other doorways to exit. With more space, volunteers will be able to work with clients who will shop for food and supplies in the new facility. Donley thanked her board, staff members and co-chairs Steve Englet and Gorrell for their help as well as consultant Lori Hunter Overmyer of Goettler Associates in Columbus, who helped organize a plan for the entire project. “We could have never envisioned doing this without her,” Donley said. 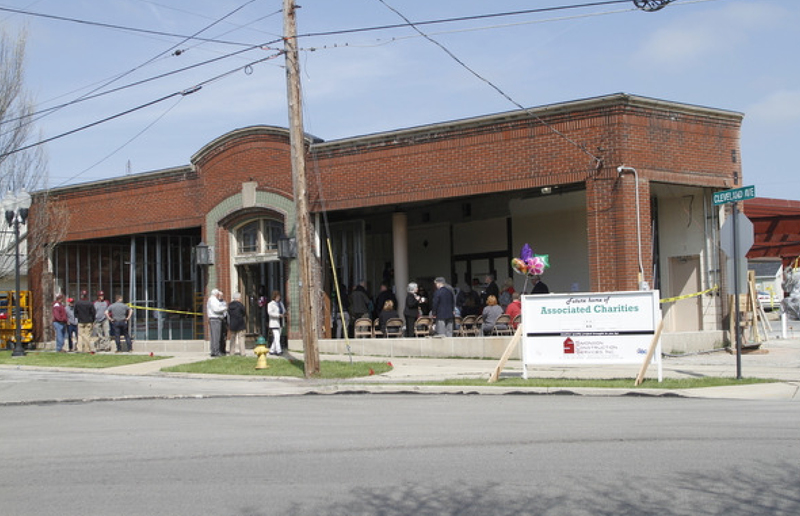 Associated Charities is relocating to a new location in the old Steiner building at 240 Cleveland Ave., where a ceremonial groundbreaking took place Wednesday. When finished, the new location will have handicap access for older volunteers and clients, more storage and more parking space. She extended thanks to Simonson Construction, which is handling the renovation project. Along with multiple donors, the charity’s board members raised $80,000 since November 2015. Mayor Glen Stewart said he is honored to serve citizens who are not afraid to express compassion to those needing help. Other speakers included the charity’s board president Joe Reep, Bob and Jan Archer and Englet. “I’m humbled and astounded by the support of you all, so you can say it’s yours,” Englet said. After the ceremony, Donley and Aaron Dearth of Simonson Construction guided guests through the buildings future rooms and their purposes. If I had a life to live over, I think I would want to do what you folks do with others. I remember with great fondness your effective guidance with the KSU-A campaign. Great fun!